Rather than reduce complicated historical events into one single narrative of forced exile, archeologists Mati Aviam and Zeev Weiss postulate a more complicated landscape. Their findings suggest that some ancient Jews did not rebel against Roman pagan rule and so were not forced to leave their homeland after the destruction of Jerusalem and the Jewish temple. In Sepphoris, recent archeological discoveries of a pagan temple and Roman theater can be interpreted as evidence of a climate of co-existence. To further untangle myth from history, the film retraces the career of Josephus Flavius whose writings provide one of the major accounts of the “heroic rebellion and exile.” Josephus, the son of a Jewish religious elite, traveled to Galilee with orders to incite support for the rebellion. He failed, and the Romans later took him prisoner. In spite of this, he became part of the Roman inner political circle, and his revisionist historical writings of a great war between the Romans and the Jews served to legitimize Roman rule. The documentary juxtaposes tasteful recreations of the past, with apparently endless throngs of tourists from all over the world reverently listening to tour guides articulating a politically convenient and emphatic version of history. Ziv’s camera captures majestic shots of Masada, a UNESCO Heritage site that testifies to the power of the established exile narrative, in order to deftly illustrate the monumental challenge entailed in daring to question this single narrative. Although the film struggles with “the power of legend over reality,” it does not confront the Palestinian conflict, and refers to 1948 as the “War of Independence.” This controversial documentary, which was pulled at the last minute from the BBC schedule, poses a rational question, and provides scientific evidence, as well as powerful imagery. 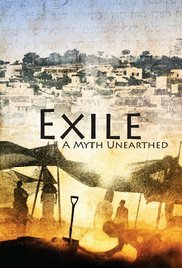 In the end, “Exile” issues a challenge to viewers, encouraging them to imagine what a different past could mean for today. This review appeared in Al Jadid Magazine, Vol. 19, No. 69, 2015.